Damage Inc., Pacific Squadron WWII begins with the attack on Pearl Harbor and takes you through all of the real battlefields of the Pacific Theatre. With 23 historically accurate missions and 100+ mission objectives, your experience will include all the challenges that actual pilots faced – - dogfighting, torpedo and dive bombing, carrier takeoffs and landings – - in a mix of intense air-to-air, air-to-ship and air-to-ground combat. Dogfight – - Dogfight other online players. Team Dogfight – - Dogfight against another team to own the skies. Survivor – - All players begin with a set number of lives and then fight until only one remains. Team Survivor – - All players begin with a set number of lives, last team with lives remaining wins. If you want to experience the ultimate thrill as a WWII fighter pilot, nothing compares to the excitement of the Pacific AV8R FlightStick. Modeled after the actual sticks found in real WWII combat aircraft, the FlightStick imparts the sensation of true flight and delivers full immersion into the game. 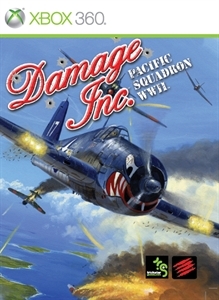 Damage Inc., Pacific Squadron WWII will ship in 2012 and be available on Xbox 360, PlayStation 3 and PC.